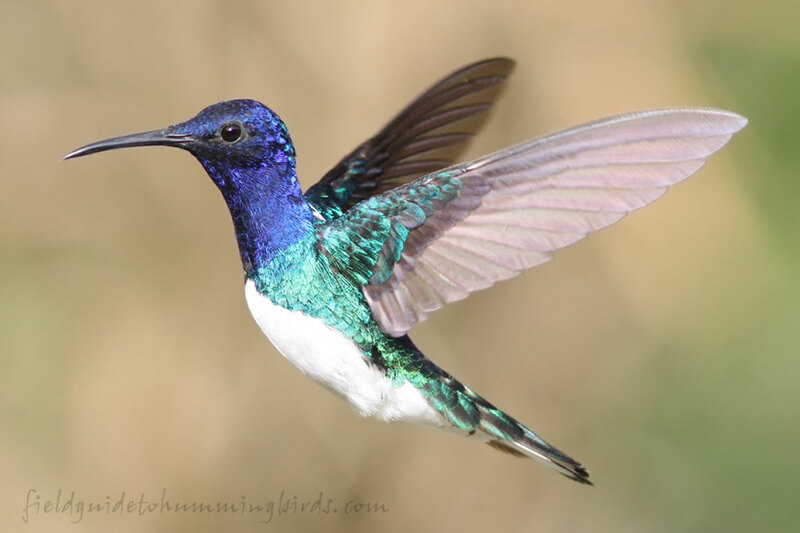 TRINIDAD & TOBAGO: Hummingbirds and More! 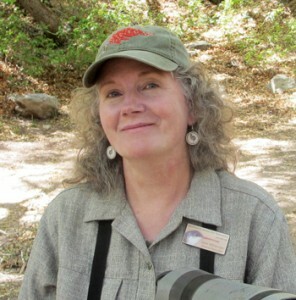 Join Sheri Williamson and Tom Wood, directors of the Southeastern Arizona Bird Observatory (SABO) for this adventure. Immerse yourself at the famous Asa Wright Nature Centre in Trinidad’s Northern Range, where, like SABO, education and conservation drives their mission; then go deep into the forest at Cuffie River Nature Retreat on Tobago. Wright Nature Centre’s legendary local guides, making this a trip not to be missed. Welcome to Trinidad! Upon arrival at Piarco International Airport, you are met by an AWNC guide who drives you from the bustling metropolis to the quiet seclusion of the Centre, about an hour’s trip up into the Northern Range. Lush forests of the Arima Valley offer untamed vistas and provide the perfect place to learn about Trinidad’s abundant birds and natural heritage. The Asa Wright Nature Centre is 1200 feet above sea level in Evergreen Seasonal Forest. Formerly the Springhill Estate, the grounds have returned to their wild roots from once extensive coffee, cocoa, and citrus plantations, though some of these plants are still maintained. However, natural second-growth festoons the abandoned plantation vegetation with vines and a host of epiphytes. The effect is one of being deep in a tropical rainforest. 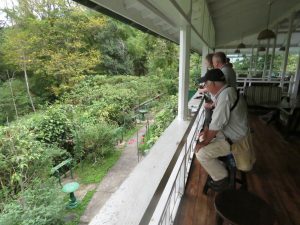 Step out onto the Centre’s wide verandah to marvel at the almost tame hummingbirds, tanagers, honeycreepers, oropendolas, Bananaquits, and other birds that frequent the feeders. The views of the valley (and the birds) are breathtaking. Beyond the verandah, an extensive trail system beckons. If you arrive early, the entrance road is an easy walk, where, under a lush canopy, Trinidad Motmot, Yellow-olive and Yellow-breasted Flycatchers and a host of other species can be found. Centre naturalists are on hand to help identify species. Our only challenge for the last hours of daylight is to enjoy our first rum punch (or tea) while tallying up a host of amazing species at the Centre’s abundant feeders. 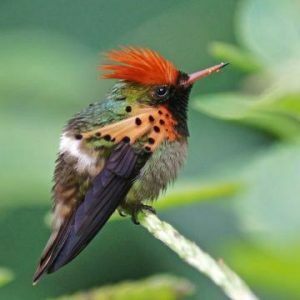 Dazzling hummingbirds, including the diminutive Tufted Coquette may put on a show, while Agoutis busy themselves below the verandah. Tea time is at 4:00 PM, followed by Rum Punch at 6:00 PM and then dinner. Meet your fellow guests and enjoy the surrounding nature. Morning begins with the raucous noise of the Crested Oropendola, just one of many exotic sounds. Fresh-roasted Trinidadian coffee awaits on the verandah ― first-time visitors might see 40 life birds before breakfast! Our day starts with a guided tour of the Centre trails. 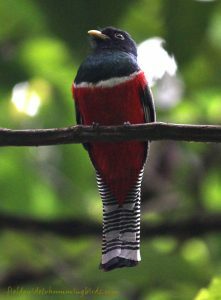 We may find Guianan (Violaceous) Trogon, Channel-billed Toucan, Golden-olive and Chestnut Woodpeckers, White-bearded Manakin dancing at lek, Rufous-browed Peppershrike, and perhaps a mixed flock that includes Turquoise and Bay-headed Tanagers. 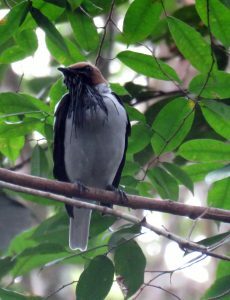 We also hope to spot Golden-headed Manakin and noisy Bearded Bellbird ― many enjoy the challenge of spotting the Bellbird, as their distinctive “bonk!” echoes throughout the forest. Red-rumped Agouti spend time foraging forest fruits that have dropped beside the trail. Crested Oropendola stream overhead and we keep watch for Orange-winged and Blue-headed Parrots, as well as raptors like Ornate Hawk-Eagle, Black Hawk-Eagle, and White Hawk. The Centre’s resident naturalists share their wealth of knowledge. In the afternoon we explore Centre trails or spend time on the verandah with Sheri and Tom, learning to identify the hummingbirds. Photo opportunities abound! Just after breakfast we embark on a scenic, all-day excursion following a lush and winding mountain road that passes over the Northern Range towards the seaside fishing village of Blanchisseuse. The Northern Range is an eastern extension of Venezuela’s Coastal Cordillera, a range that connects to the Andes! Blanchisseuse is the only road on the island that bisects the Northern Range before finally descending to the Caribbean coastline. We reach the highest elevation possible by motor vehicle, some 2,200 feet. 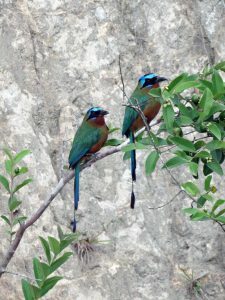 Our day is spent birding quiet country roads and wide forest tracks, seeking species more easily found at this altitude. Although a day-long outing, we do not spend a long time driving. We make numerous roadside birding stops, never walking far from the vehicles. And there are always coolers with water and juice on board. We enjoy lunch and learning about cacao and chocolate production in the village of Brasso Seco where clean washroom facilities are available. Species we look for today include Short-tailed Hawk, Blue-headed Parrot, Lilac-tailed Parrotlet, Ferruginous Pygmy-Owl, Collared and Green-backed Trogons, Golden-olive, Red-rumped, and Chestnut Woodpeckers, Stripe-breasted Spinetail, Streaked Xenops, Cocoa and Plain-Brown Woodcreepers, White-bellied Antbird, Black-faced Antthrush, Gray-throated Leaftosser, Dusky-capped, Slaty-capped, Streaked, and Euler’s Flycatchers, Gray-breasted Martin, Rufous-breasted Wren, Long-billed Gnatwren, White-necked Thrush, Golden-fronted Greenlet, Speckled and Hepatic Tanagers, Blue Dacnis, and Golden-crowned Warbler. Bright blooms of the forest canopy attract a number of nectar-feeding birds. 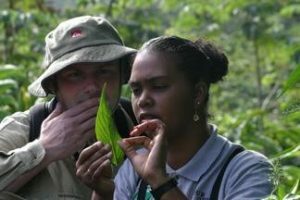 Along with rich birdlife, we also examine the fascinating world of leaf-cutter and army ants, and photograph orchids, elephant ear philodendron, ferns, mosses, and other tropical flora. Occasionally an Ornate Hawk-Eagle is seen soaring over and there is an outside chance of finding Trinidad’s most rare and sought endemic today ― Pawi or Trinidad Piping-Guan. Several Pawi reside in the high forests but we are lucky if we do find them. In December, wintering American Redstart and Northern Waterthrush can be found intermingled with resident species. Towards mid-afternoon we stop at the village of Morne le Croix. Here we take afternoon tea and cake whilst looking for additional species such as Rufous-tailed Jacamar, Pale-breasted Spinetail, Southern Rough-winged Swallow, and Yellow-rumped Cacique before a late afternoon drive back to the Centre. Immediately after breakfast, we leave the Centre and travel south down the Arima Valley before turning east. Great Kiskadee and Tropical Kingbird regularly perch on overhead utility wires, Carib Grackle abound, and Short-tailed Swift are the most common aerial feeder. Just below the foothills of the Northern Range lies the Aripo Agriculture Research Station, which breeds a Water Buffalo/Brahma cross. This open countryside and rough pasture gives us new species, including Cocoi Heron, Savannah Hawk, Gray-headed Kite, Yellow-headed Caracara, Wattled Jacana, Southern Lapwing, Green-rumped Parrotlet, Fork-tailed Palm-Swift, and White-winged Swallow. White-headed Marsh-Tyrant, Pied Water-Tyrant, and Yellow-chinned Spinetail rattle throatily from the grasses while Red-breasted Blackbird adds a splash of color. We can reliably find Grassland Yellow-Finch and possible Ruddy-breasted Seedeater here too. We enjoy a picnic lunch on the beach at Manzanilla with views of Magnificent Frigatebird and Brown Pelican, then drive through “coconut ally” where a million coconut palms line the road. We look for raptors sheltering from the midday sun ― Common Black-Hawk, Yellow-headed Caracara, and Savannah Hawk and maybe even Pearl Kite, Gray-lined Hawk, and Crested Caracara. Roadside mangroves house Plumbeous Kite, American Pygmy Kingfisher, Black-crested Antshrike, Silvered Antbird, and Brown-crested Flycatcher. Eventually we enter Nariva Swamp. Here, the Nariva River reaches the sea; freshwater environments are comprised of herbaceous swamp and swamp forest. This is the largest freshwater herbaceous swamp on the island. Along its edges are “palm islands,” of tall Moriche Palm. Here too we see a unique mangrove community, made up primarily of the stilt-rooted rhizophora mangrove, which often reaches 80 feet. We slowly drive the raised bund roads looking over freshwater marsh and watermelon fields. We hope for Pinnated Bittern, Black-bellied Whistling-Duck, Purple Gallinule, and Yellow-hooded Blackbird. We also search for the enchanting White-tailed Goldenthroat hummingbird. Long-winged Harrier occasionally quarter the reeds and if we are lucky, both Yellow-crowned Parrot and Red-bellied Macaw fly in to roost. Close to here we walk into Bush Bush Forest Wildlife Sanctuary. Bush Bush Forest is good for birding and a chance to see Red Howler and White-faced Capuchin Monkeys, as well as other mammals like Prehensile-tailed Porcupine. 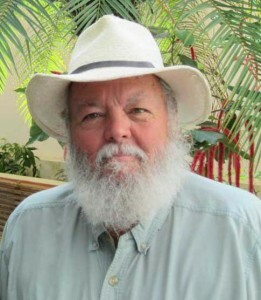 The forest is a raised area of sandy soil surrounded by wetlands, and site of much of the work of naturalist C. Brooke Worth, described so well in his book, A Naturalist in Trinidad. In 1999, a successful reintroduction effort to restore Blue-and-yellow Macaw began here. Permits are required and hunting is not allowed ― it’s a good place to look for mammals. Plan for a late arrival back at the Centre where we check the feeders for Tufted Coquette and other hummers, then head straight to dinner. We wake to sounds of the forest and enjoy early morning birding and coffee on the verandah. After a leisurely breakfast, we depart mid-morning for Caroni Marsh via Yerette, Trinidad’s “Home of the Hummingbird.” Yerette is the private home of Theo and Gloria Ferguson (and up to 1,000 hummingbirds!). It is birdwatching at its most relaxing. Thirteen of the islands’ recorded 17 species of hummingbird have been seen here; eleven are found daily, often twelve. Here we can watch a hummingbird feeding frenzy mere feet away. We bring a picnic lunch to have our own feeding frenzy while were here. Theo is a bird photographer par excellence and takes pride in inviting you to a professional, interpreted slideshow of Trinidad’s hummingbirds. Then, we are off to Caroni Swamp, 6000 hectares of protected area, including National Park lands. Mainly mangroves, it holds a very specialized mangrove forest that contains several genera and species of mangroves, showing classic examples of plant adaptation in a unique brackish water community. This wild area is south of Port of Spain’s sprawl, but worlds away from the city’s congestion. We identify mangrove species from the road, which house Black-crested Antshrike, Pygmy and Green Kingfishers, Rufous-browed Peppershrike, Straight-billed Woodcreeper, and Masked Cardinal. Clean washrooms are at the National Park Information Facility. As our boat departs and slowly navigates mangrove channels, we look for Green-throated Mango, Greater Ani, Bicolored Conebill, Neotropical Cormorant, Anhinga, Striated Heron, White-cheeked Pintail, Large-billed Tern, Pied Water-Tyrant, and Masked (Red-capped) Cardinal. We may even see roosting Tropical Screech-Owl, Common Potoo, Green, Ringed, and American Pygmy Kingfishers, and Boat-billed Heron. We keep a special eye out for Ruschenberger’s Tree Boa, roosting and tiny Silky Anteater, and Spectacled Caiman. 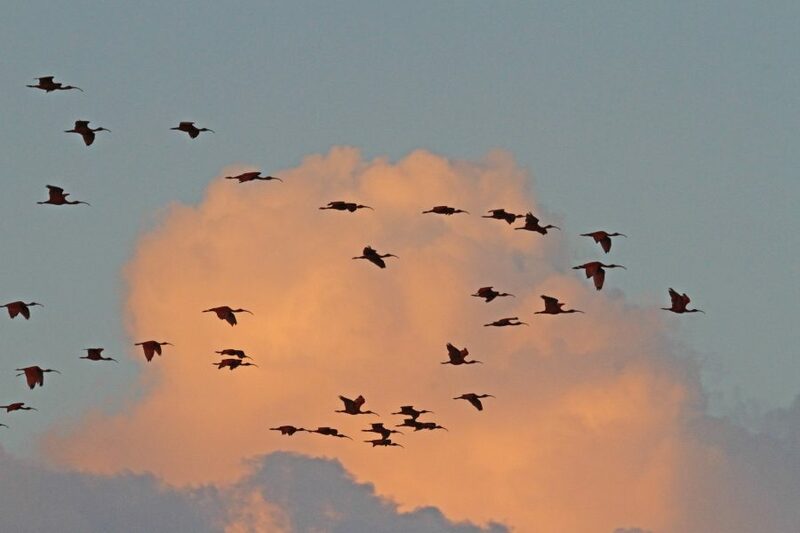 We then moor up, sip our rum punch, and await the star attraction: 100s, and sometimes 1000s of Scarlet Ibis, returning to their mangrove roosts at dusk. 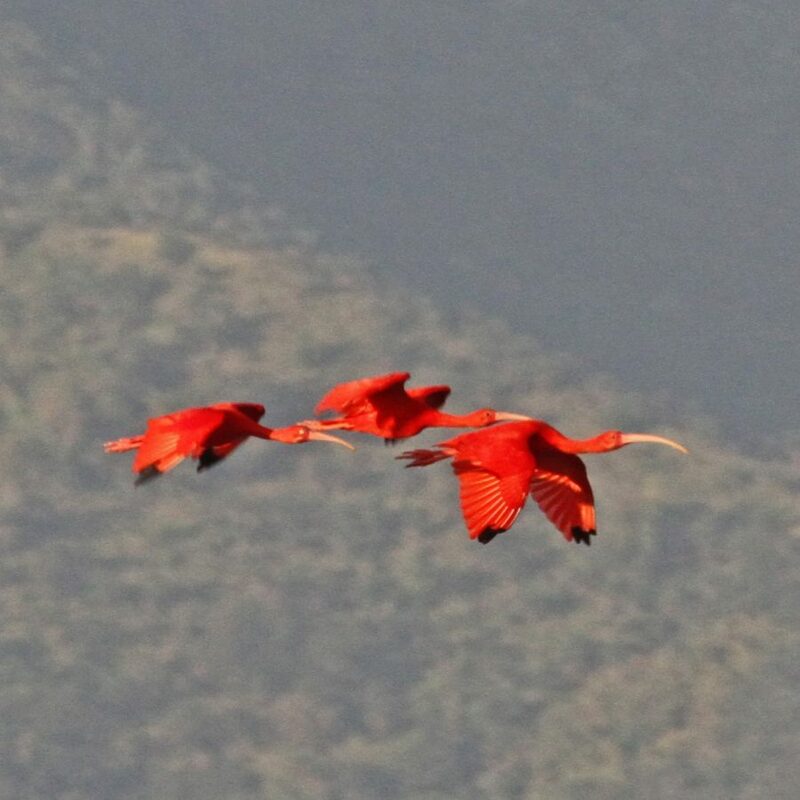 Tricolored and Little Blue Herons and Snowy Egrets pepper the wave of crimson. This is truly one of the world’s most dramatic natural moments. We leave as light begins to wane and search for the mysterious-sounding Common Potoo and nocturnal Boat-billed Heron as we head back to shore. Dinner is a bit late tonight, but well worth it. Today we have the full day at the Asa Wright Nature Centre. In the morning, we hike to Dunston Cave, a beautiful riparian grotto on Centre grounds and home to a breeding colony of Oilbirds. This is one of the most accessible Oilbird caves in the world. A walk along Guacharo Trail gets you there in around 45 minutes. The trail can be steep in places, but there are well-placed handrails along the way. To see the birds, you may need to get wet feet, though if they are in the front of the cave you do not, just a head’s up so you are prepared. 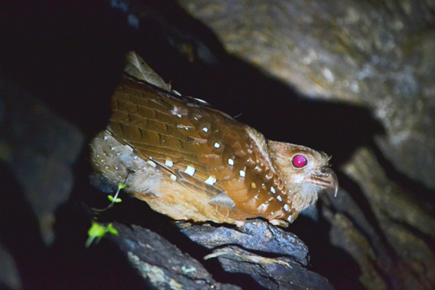 The Oilbird is the only fruit eating, nocturnal bird and it navigates the cave by echo location. It’s also much bigger than anyone expects (a wingspan of up to 42”). The cave floor is littered with germinating palm seedlings, which the Oilbirds swallow entirely, and, after the pericarp is digested, they regurgitate the seeds. Oilbirds are important to the seed dispersal of a number of tropical trees. We return for lunch, and then have the afternoon set for guide’s choice of trails, or walking the grounds. People may want to visit the coffee growing area, and the Centre’s driveway is a leisurely and flat place to bird and explore. This morning you say goodbye to the wonderful staff of AWNC and embark on the journey to Tobago. Enjoy coffee, tea, and breakfast on the verandah before we depart. Since you are handling your luggage, today you can choose to buy lunch at the airport or carry a sack lunch from the Centre (ask the night before). For those who like to try local foods, we highly recommend doubles, the local favorite — ask your guide where to find them as you’re dropped off. You eat your lunch at the airport as you wait for your flight to Tobago. Generally, check in is quick and you have time. Once you land in Tobago, your birding guide greets you in his air-conditioned bus. Welcome to the distinctly Caribbean and laid-back Tobago. You make a few stops for birding, so be prepared with close-toed shoes, sunscreen, hat, and binoculars. We then travel through vibrantly-colored hillside villages to the Cuffie River Nature Retreat. Once you arrive, enjoy the late-afternoon to stroll the grounds, take a dip in the pool, or just relax. 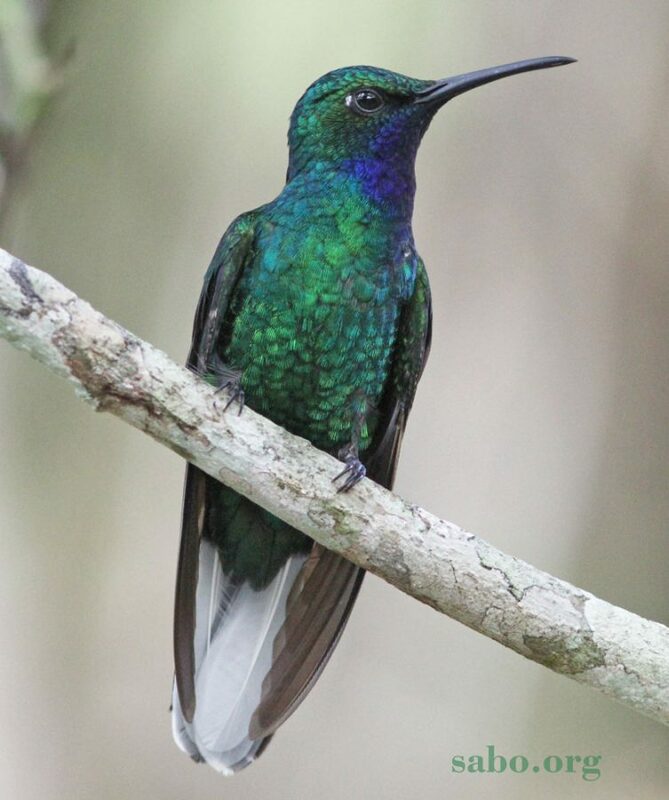 We enjoy a lovely time at this intimate forest lodge where Tobago’s White-tailed Sabrewing, a near endemic, comes to feed alongside Ruby Topaz, quite possibly the most beautiful hummingbird in the world. The charming Cuffie River Nature Retreat is nestled in an intimate forest setting; birding on the grounds is excellent, and you can relax in the pool or enjoy the birds from one of several verandahs and sitting areas. Cuffie River Nature Retreat is a small inn; please ask the staff for any needs, such as tea, beer, or wine, a pool towel, etc. Dinner is announced daily, usually at 7:30 PM. Food is local and specially prepared, so relax and enjoy this wonderful dining experience! Perhaps you’ll see and hear a Common Potoo right outside the dining area as you linger over dessert. 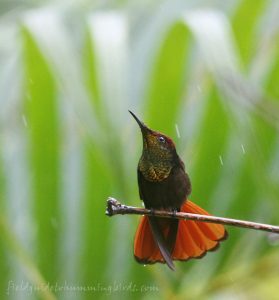 This is the perfect place to continue our journey, with a focus on hummingbirds and their role in Trinidad and Tobago’s avifauna. In keeping with Tobago’s laid-back vibe, today is easy-going. In the morning you explore a nature trail close to the lodge, walking from the entry with the lodge’s expert guide, Desmond. While you never move faster than a birder’s pace, the trail is up and down small hills, so a walking stick may be handy. Return to the lodge for a delicious lunch, then savor a free afternoon. 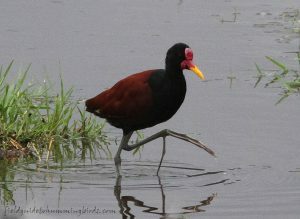 Most prefer to simply enjoy birding and photography on the grounds and time at the refreshing pool. If you would like to go snorkeling and swimming at a nearby beach, or visiting cultural sites or shopping, your lodge host can arrange a taxi for you; please ask a day in advance if possible. Avid snorkelers can arrange a boat- assisted trip to some of the island’s best reefs; you need the full day, which requires advanced notice. Be sure to be at a good viewpoint for sunset, as hordes of parrots, parrotlets, and noisy chachalacas fly in to roost — quite a spectacle! After dark, check the driveway’s street light for night birds. We have an early start today — a full day of great birding awaits! We drive to Speyside on the east end of Tobago. 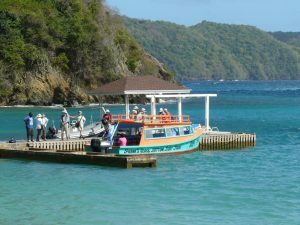 From the bay we travel by boat from the Blue Waters Inn dock to Little Tobago Island, one of this nation’s most important wildlife sanctuaries. Upon landing we explore the dry forests of Little Tobago Island, looking for Chivi Vireo, Brown-crested Flycatcher, and Pale-vented Pigeon. Climb up to a lookout for a view of nesting cliffs above a grand expanse of ocean. Additionally, we explore the nesting grounds of Red-billed Tropicbird, Red-footed and Brown Boobies, Brown Noddy, and Sooty and Bridled Terns. We then return to a restaurant lunch at the Birdwatcher’s Restaurant in town, and then on the return drive, explore the mountains at Tobago’s premiere UNESCO World Heritage Site: The Main Ridge Forest Reserve. Established in 1776, the Reserve is one of the oldest legally-protected forest reserves in our hemisphere. Early on, its managers had the foresight to understand the connection of a healthy forest and a productive watershed for the island’s agricultural areas below. This is an excellent place to see White-tailed Saberwing in its nesting area, a stunning hummingbird thought to be lost, but rediscovered here after Hurricane Flora altered much of the island’s forest habitats in 1963. On a winding trail that descends into the forest, we also look for Blue-backed Manakin, Olivacous Woodcreeper, Yellow-legged Thrush, both Fuscous and Venezuelan Flycatchers, the elusive White-throated Spadebill, and Plain Antvireo. Common Black Hawk may soar above, the main avian predator here. Tobago has weathered several hurricanes over the years and it is interesting to note how this has sculpted the forests, evidenced here by numerous palms. After our hike, we return to Cuffie River Nature Retreat for a relaxing evening. After a big day yesterday, we enjoy a final morning with coffee and the birds before departures. Today you return to Port of Spain in Trinidad to catch international flights home. Your departure from Cuffie River is timed accordingly; your guide confirms this with you the day before. If you have a later flight, we arrange lunch and if possible, a late checkout (additional expense). There are flights back to Port of Spain almost every hour; we schedule the best one to match up with your departing flight. If your home-bound flight leaves before 10:00 AM, you must spend an additional night at an airport hotel before flying out the next day. Please discuss this with a travel planner. Cost of the tour from Piarco International Airport (POS), Trinidad, is $2890, based on double occupancy, $3390 SGL single occupancy. The tour price is based on a group of 7 or more persons with two SABO hosts. This cost includes all accommodations, meals as specified in the itinerary, professional guide services, other park and program entrance fees, inter-island fights, and miscellaneous program expenses. Tour cost does not include: round-trip transportation from your home city to Port of Spain/Piarco Int. Airport (POS), optional activities, lodge and guide gratuities, or items of a personal nature such as laundry, telephone charges, maid gratuities, or beverages from the bar. Group Size: Minimum of 4 persons, maximum of 12. Please contact Caligo Ventures at info@caligo.com, or by calling 800.426.7781. They will know space availability, and will provide you with registration forms on behalf of SABO. The deposit is $300, and the balance of payment is due 60 days ahead of departure. This itinerary is subject to change to due to weather, road condition, access, and other real-world factors. The order of the field trips may also change. Should a location or region become unviable, we make every effort to visit an equivalent location or region.